After making a quick topic search i couldn't find a thread that could serve as a space for Valdebebas and Bernabeu stadium news so here's this. Incase anyone is interested, here's a website run by a 68 year old Real Madrid socio that focuses on Santiago Bernabeu and Real Madrid City (Valdebebas) news. -During the past year, two new grass pitches and a new multi-use complex (still in progress) have been built in Valdebebas. Here's some recent pictures of the current state of our impressive sporting complex. The sporting complex mentioned will primarily be used as a training complex for our Basketball division (reigning Spanish and European Champions) as well as for institutional related events. Another new building is also currently in construction in Valdebebas and will likely be ready by the start of 2017. It will be used as the club's corporate building/offices. Based on the pictures, i believe it will be built on the same side in which the recent youth building was built. I think you can actually see the youth building in the following pics. 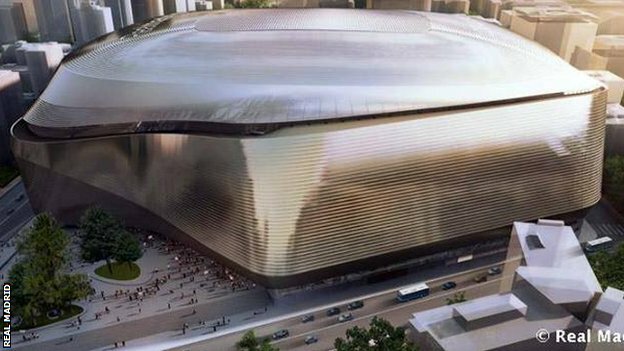 As for the Santiago Bernabeu renovations, they remain paralyzed because the courts have ruled against the occupying of more public space by the proposed new hotel and new commercial space. I think the big hunk of new space evident in the following picture is the problem. I have merged it into the appropriate thread. We don't have a thread for each stadium update but this thread serves for all. @Kick wrote: I have merged it into the appropriate thread. Thanks for sharing the post in the general section but i originally intended it for the Real Madrid Sub-Forum (which is where i believe i originally posted it. Unless i made a mistake). It was originally posted in the general section. I have put it in the Madrid section now. That Bernabeu design is atrocious and will age very badly. Wft is that.